Eco Church event: sign up now! 31 August 2017, Comments Comments Off on Eco Church event: sign up now! It’s a rare treat – and it’s turned up at our nature reserve Foxearth Meadows! The variable damselfly hasn’t been seen in the region since the end of World War II. 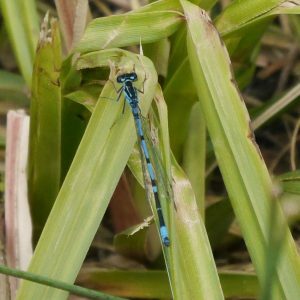 According to the British Dragonfly Society, the variable damselfly is scattered but uncommon across mainland Britain. And despite being well known from a handful of sites, the species’ distribution still remains ‘something of an unravelled mystery’, said the BDS.